Your contributions will be used to provide the highest quality after-school programming to Milwaukee's urban children. 94% of participants qualify for free or reduced lunch. Your gift of $25 will provide one child with a healthy snack after school each day of programming. Soccer, the world's most popular sport, is also an inexpensive and accessible sport for urban children. Your gift of $50 will provide cleats and a soccer ball to one child. One soccer ball can create healthy opportunities for countless children. Additionally, this gift will also cover the cost of writing supplies for one child for the entire year! With no safe green space in walking distance, SCORES kids practice in parking lots and on concrete playgrounds. 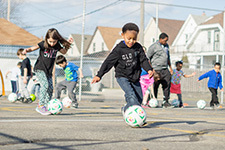 America SCORES Milwaukee buses hundreds children to local park where they play soccer games against other SCORES schools. Your gift of $100 will cover the cost of one bus trip for a team of 16 girls and 16 boys from one school. 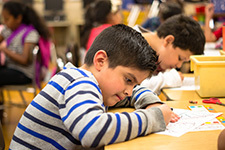 What sets SCORES apart from numerous other after-school programs in Milwaukee is that we hire school-day teachers to implement our nationally-developed writing, soccer, and community service curricula. While this is our largest expense, outside studies, along with our annual evaluation reports clearly demonstrate the benefit of having qualified and passionate staff working with our communities at-risk youth. 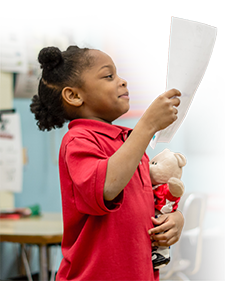 Your gift of $250 helps support the teachers who stay after-school each day to provide additional learning opportunities to our children. Your gift can change a life. Your company’s matching gift can change another. Did you know that hundreds of companies across the country match employee contributions to America SCORES Milwaukee? Learn how it works and see whether your employer will double or even triple the impact of the donations you’ve already made! Simply contact your employer’s human resources office and ask whether your company matches employee donations. Print or request your company’s matching gift form, or submit via your workplace intranet. Review the program guidelines to see whether America SCORES Milwaukee is eligible. Mail completed form to us, and we’ll handle the rest. The company will send its matching donation directly to America SCORES Milwaukee. America SCORES Milwaukee is a program of the Milwaukee Kickers Soccer Club - a registered 501(c)3 non-profit organization.